Composite repair is a modern 'craft' skill that requires personnel to be 'multi-disciplined' as well as ‘patient and methodical’ in their approach. Delegates who have fine craft skills, fine craft based hobbies, enjoy solving technical problems, are technically minded and good with their hands often succeed with composite repair. Our composite repair courses provide key training covering the basic skills, knowledge and understanding for all personnel. Nobody can train a delegate to be ‘skilled/competent’ within a week, it takes months of experience. We provide the solid foundation from which to develop. For inexperienced technician level delegates, this allows delegates go into the working environment informed and able to start with simple jobs under supervision, where skills can then be gained with practice, usually within 3-6 months. For experienced personnel, engineers and designers, this allows delegates to better understand a wide range of materials, techniques, process conditions that can greatly influence the effectiveness of a composite repair. As training providers it is our responsibility to ensure training is up to date and taught to the highest standard. 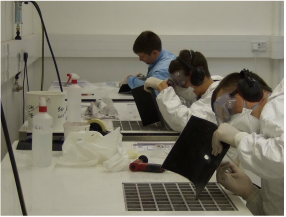 To assist with this we have aligned our composite repair courses with the requirements of the SAE’s AIR4938 standard, 'Composite and bonded structure technician/specialist training document'. This standard was produced by the worldwide 'Commercial Aircraft Composite Repair Committee' (CACRC) and defines the foundation content and structure for composite repair training that is applicable to all industry sectors. Our stage 1 and 2 composite repair courses already covered cross sector repair techniques with a full range of materials, processes, tools and techniques and were already 90% in line with the AIR4938 standard. As all our courses are already in line with the UK’s National Occupational Standards for composites and fully documented to the UK’s Qualifications and Curriculum Authority requirements, it was a relatively easy task to cross reference to the AIR4938 standard and add 10% more technical content to our repair courses. The end result is that all our customers benefit from the work we do for aerospace. This course provides comprehensive training, understanding and application of a full range of composite repair techniques to composite mouldings, from cosmetic through to structural repairs. Emphasis is on understanding failure modes, recognising materials and production process, and the correct use of tools, techniques, abrasives and dust extraction in order to apply effective repairs. This progression course addresses more advanced composite repair techniques and issues in respect to more extensive and complex structural repairs. 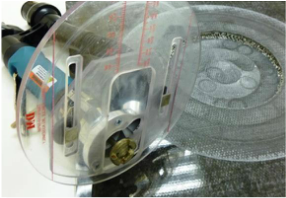 Advanced composite repairs use repair tooling, step sanding routers and jigs, standard repair patches and more extensive heat mat/lamp curing of materials. Emphasis is on refinement of the repair techniques and methodologies and working with on-tool extraction and dust containment/control. Experience has shown that technicians tend to use tools and equipment as they see best. 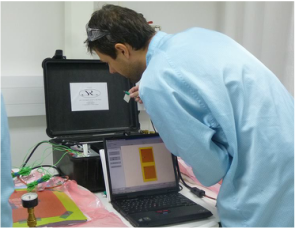 This two day course provides full technical information on how to set-up and use dark matter composites ‘Step Sanding Tool Kit’ most effectively. Correct use of the router and jigs provides consistent, dust free repairs that can save 50-75% in time compared to using standard tools. This is suited to repair personnel who do not require our stage 1 & 2 courses and want to get the best from this equipment.